We mentioned in an earlier post that there are two main things that pertain to our children’s ministry space. The first one, discussed here, has to do with the number of children we have and are projected to have in our children’s ministry in the coming years. The second factor is the kind of space that is now being designed for children’s ministry. In the time since our children’s space was built, things have changed in the world of children’s ministry. There are several differences that you might have encountered if you have visited other churches, but a big thing is that of security. Children’s ministry spaces tend to be more isolated in terms of access than ours is. Children’s Sunday school classrooms do not share hallways or restroom facilities with adult or youth spaces in these more recently-designed buildings. Parents check their children in, and pick them up, from a lobby area, and otherwise might not be in the classroom area. This need, to isolate and restrict the access to children’s ministry space, plus our need for more space for children, has caused us to consider renovations to the current ‘education wing’ to turn it all into children’s ministry space. In our building, our children’s Sunday school rooms and nursery rooms are right across the halls from adult classrooms and youth classrooms. We would change this by moving the adult and youth space to somewhere else. 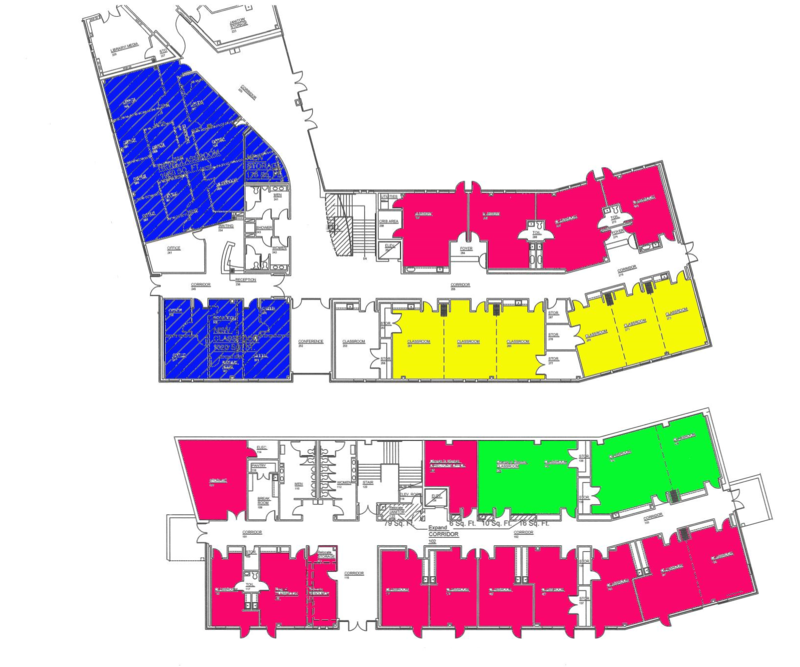 The diagrams below show space that is currently adult space (yellow) and youth space (green), which renovation could turn into children’s space (current children’s space is colored pink in these diagrams). That possibility brings with it a question of where would we move the adult classrooms to, and where would the youth go. These are things that we think have to be solved by building an additional building on our site. More about this will follow in future posts.